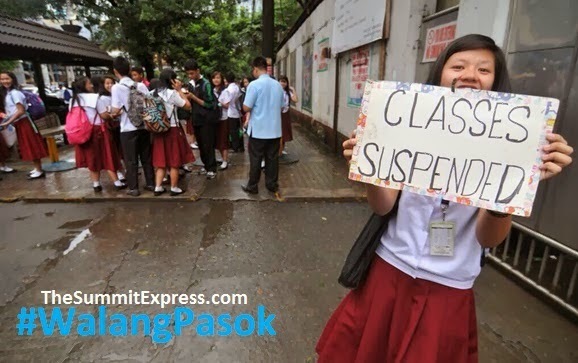 Manila, Philippines - Some local government units (LGUs) and schools announce class suspensions for tomorrow, July 18, 2014 (Friday) due to the effects of Typhoon 'Glenda' which pummeled the country on mid-week. The advisories were released through social media Thursday night, July 17. 'Glenda' is already out of the Philippine Area of Responsibility (PAR). However, a new low pressure area (LPA) is expected to enter the country in the next 24 hours. Once the LPA intensifies into tropical cycone inside PAR, it will be named "Henry," the eight typhoon to enter the country this year and the third for the month of July. At 8:37p.m on Thursday, PAGASA advised that moderate rains can be expected over Pampanga, Bulacan, Metro Manila, Cavite, Rizal, and Laguna. "All are advised to take precautionary measures against heavy rains, strong winds, lightning and possible flashfloods," the state weather bureau said.